Jackalope ratchets up the tension in the Midwest premiere of Zayd Dohrn’s border thriller. When was the last time a play made you jump in your seat? 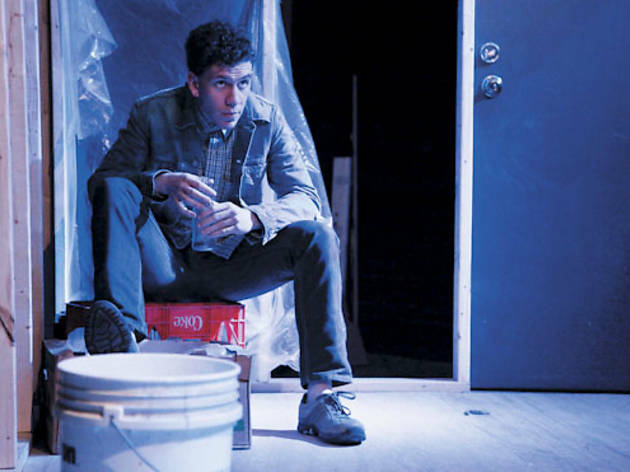 There’s a moment midway through Zayd Dohrn’s exhilarating 2010 drama that cracks the building tension with such intensity the audience collectively gasped on opening night. Theater can be a difficult medium for suspense, but Long Way Go Down shows how effective a live thriller can be. Nini (Daniel Martinez) and Violetta (Paloma Nozicka) are Mexicans who have just been transported across the border by a father-son pair of immigrant smugglers. When Nini can’t come up with the $1,000 he owes, Violetta is held as collateral until he gets the money, sparking an unlikely friendship between the woman and her kindhearted captor, Chris (Adam Brown). Each member of the perfectly cast ensemble creates a character who’s believable and likable, even when despicable. Dohrn writes fantastic dialogue, masterfully balancing grit and humor in a script that’s brutal but never overbearing. He’s particularly skilled at addressing social issues in casual conversation, making the play feel both personal and expansive. Set designer John Wilson makes great use of the large space; a massive big rig stage right becomes a haunting presence. Kaiser Zaki Ahmed directs a tight, briskly paced production, aided by Alex Farrington’s devastating fight choreography. Funny, powerful and only $15 a ticket, Long Way Go Down is one of the best values in the city.